I love food. I love food so much that I really, truly hate to see any be wasted. That's why bread pudding is such an awesome sweet treat - a real "recycler recipe" :) It lets you use up stale bread that would otherwise end up in the trash and you can dress it up with whatever fix-ins you have in the cupboard (chocolate chips, dried fruit, bananas)! For this bread pudding I used some homemade raisin bread (compliments of my mother-in-law) and some whiskey left behind from a recent girls' night. What are your favourite "recycler recipes"? -Whisk together milk, eggs, sugars, molasses, vanilla, and cinnamon. -Add bread and stir to coat. Let sit for 20 minutes. -Divide mixture between 6 muffin cups. -Let cool slightly in cups before serving. -Melt butter and sugar over medium heat. -Add whiskey and let cook off for about 10 minutes, stirring often. 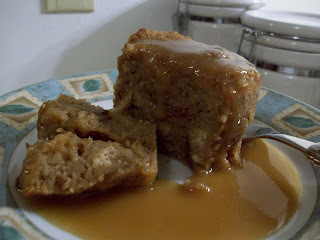 luscious Bread Pudding with a nice cinnamon flavor. What a yummy looking bread pudding! Love the cinnamon. i love bread too much...it never even has a chance to go stale here! i just have to toast it when i'm making a bread pudding. this looks great! i just might be able to not eat my bread for a day or two if i get to eat this! thanks kristen :) it had a really nice cinnamon falvour - not too powerful. Mmm, you can never go wrong with bread pudding! Looks great. The pudding sure looks great! A delightful recipe to share with family and friends. I've been searching bread pudding recipes today - and saving bread bits forever - and I think yours is def. going to be the winning recipe. So excited!